Hanging oil-lamps were used widely in mosques in the Islamic world and would have been hung from metal chains attached to the three glass handles. 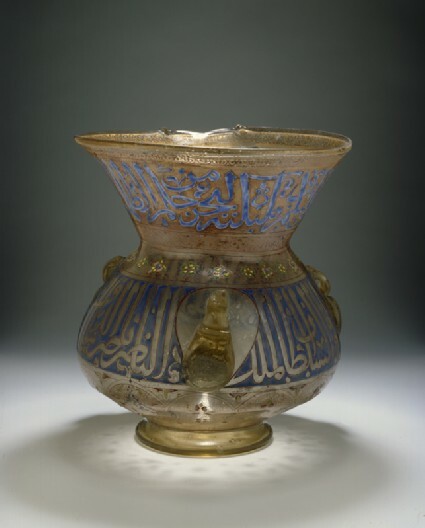 As with this example, such lamps were often decorated with part of a famous verse (Verse 24:35, The Light Verse) from the Qur’an, illustrating the importance of both light and lamps. In this case, it appears around the flaring mouth of the lamp. 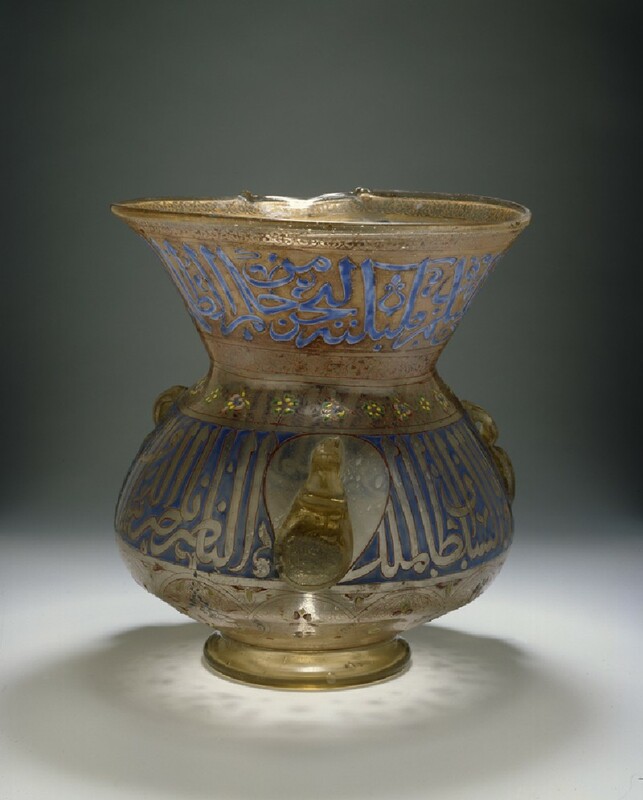 This lamp was commissioned for a religious building by Sultan Muhammad ibn Qala’un, ruler of Egypt and Syria from about 1294 to 1340 AD (with interruptions), whose name appears around the body of the lamp. The art of glassmaking originated in Syria and it was here that much of the best Roman glass was created. Enamels or precious metals were applied to the glass in an oil-based medium using either a brush or reed pen. Because different substances required different temperatures to fix them permanently to the glass, a procedure was developed whereby all the colours could be fired together to avoid the possibility of deforming vessels through repeated heating. Purchased with the assistance of the Friends of the Ashmolean Museum, 1972.